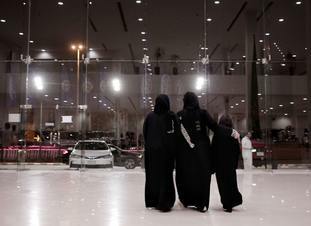 Women in Saudi Arabia can now legally drive after a ban on females behind the women was lifted. The move which came into force at 12am local time on Sunday (10pm BST on Saturday) places Saudi women at the centre of a major transformation being spearheaded by Crown Prince Mohammed bin Salman. The ban on female drivers was just one of Saudi Arabia's many human rights abuses which stained its reputation, kept women subjugated and hindered economic growth. The lifting of the ban comes amid a tug-of-war between women agitating for more openings for them, and a religious majority that remains wary of changes that could be influenced by the West. Religious police could also detain groups of unmarried men and women for simply standing or sitting together, ensured restaurants and shops closed for daily prayers and waved sticks at women who had their hair or face uncovered. He is seen as the force behind the king’s decision to lift the ban on women driving. “I will get a license, but I won’t drive right away because the elders are always scared. "But the young people are motivated and we need at this time someone like Mohammed bin Salman – motivated, God bless him, and daring. "He will move the country (forward) faster,” she said. Granting women the right to drive is part of a wider blueprint for the future drawn up by the crown prince. The Government is pushing Saudis to become less reliant on the Government for jobs, handouts and subsidies. The state cannot create enough public sector jobs to keep up with the pace of Saudis seeking work, so foreigners are being booted out of jobs to make way. Companies must stack their workforce with a minimum number of Saudi nationals or face heavy fines. The prince has branded the reforms a return to “moderate Islam”. Even the country’s ultra-conservative clerics, who for decades warned against allowing women to work and drive, have toed the line with muted statements of support.